I have been aware of these tapped horn plans, but have been reluctant to post them. I would have expected Danley Sound Labs to be a bit edgy about these plans leaking out, but they don't seem to put much effort in having them taken off line. So hurray! This thread is a building report of the TH-SPUD by Danley, a regular production model. I always think that DIY-ers can do very good designs by themselves, it is very interesting to see what practical design choices professional make and what the end result is. While I can produce any number of design variations with a linear simulated response graph, Tom Danley knows which variation will deliver in the situations his customers will use his product in. Before tapped horns, Danley gave the DIY horn community the LAB horn, a detailed and perfected design for a bass horn. It gave DIY-ers the chance to build and experience a state-of-the-art horn with predictable performance. "It still is a popular ultimate DIY horn project." However, we're now in the age of tapped horns and while we have plenty of simulation abilities and there is considerable experience with the tapped horn principle, there has not been such a professionally designed reference tapped horn, such as the LAB is for the conventional horn principle. This is where the TH-SPUD comes in. I am not sure how these plans leaked out, perhaps they were sent to a potential customer to illustrate options and sizes. In any case, they ended up online, including several recommended drivers. Tom Danley even chimed in, in this thread and another, to offer background and advice! Apparently, DIY-builds have his blessing (quite possibly as an afterthought). I guess this is a similar gift as the LAB and I think DIYers will certainly enjoy this one! My name is Radoslaw, I'm from Poland. I have bought Lowther Fidelio speakers (EX3) from my friend about two months ago. I'd be very very grateful If You could help me with some questions that i have. Your help could let me improve my sound quality though it is high already as I think. At first I'd like to apologise for my english, sometimes it may be hard to understand but don't hesitate to ask me for explenation of what I wanted to say. I wanted to ask few things. 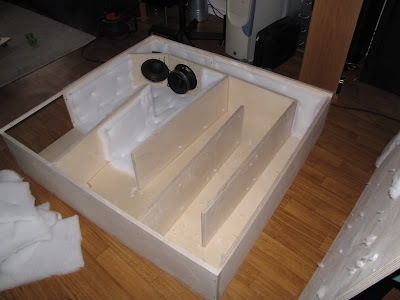 Aspecially I wanted to ask You, because You probably should know that, how should I place my speakers in my room. I have 5x3m room, now they are standing just like I drawn in the attachment. How should they be positioned towards me, should they be torsioned or should they be parallel? What I mean when I ask that.. I know that the feeling of music is a matter of taste, but I wanted to know that things from the technical side. Next thing that i wanted to ask is.. can I change my EX drivers to DX without changing the cabinet? The changing proces itself is very simple and it takes few minutes, I was wondering maybe I could buy some DX drivers and change them whether that I listen to different kind of music. Will the cabinet be large enough or maybe there is some other limit that I don't know? The next and last thing is that I wanted to ask about the Phase Equalizer. Could You tell me how do they work, how I attach them, which should I buy, and... everything that You thing should be helpful. I'd be very grateful If You could help me with my speakers. I'm very happy to listen the music from them, the change from my previous system was awesome. Now I wouldn't change them for any other ever. I'm asking, because lots of people say that there are many "tricks" that I could do with them, and that they can play even better then they are playing now. When I saw the difference between "normal" horn speakers that I had earlier and the Lowthers I was shocked, and now I bealieve that this kind of change is possible, and maybe the change that I could introduce to my system after Your reply could change what I hear again to something far more better. The attachment didn't work for me. The Fidelio's need some space behind them to work best, part of the horn is the space between cabinet and rear wall. As far as where to place them, I usually try them in every location imaginable and then go for whatever sounds best and is most practical. The closer to the corners, the more bass, but every frequency will get amplified differently. Lots of trial and error (and even better, measurements) will give best results. If I remember correctly, the rear of the EX driver is sort of an acoustic filter chamber, like the compression chamber of a rearloaded horn built it. A friend took it off without much effort and left it off. I guess you should just try. 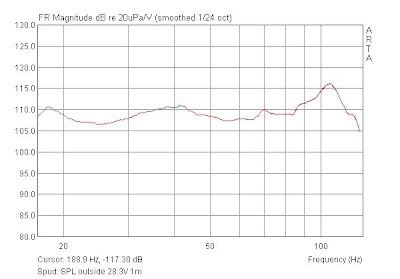 There are different phase plugs available for Lowthers and they have different goals in terms of frequency response equalization and dispersion. Might make a nice post for this blog. In the last paragraph you start with, "I will it to the linked thread to give specifics...". Is that a typo? It doesn't read quite right. It was a typo... I meant to say "I will leave it to the linked thread."